Car Built in North Royalton is Now Rad Ride! Congratulations to Mr. Jim Milliken! Jim owns this Cobra kit car. 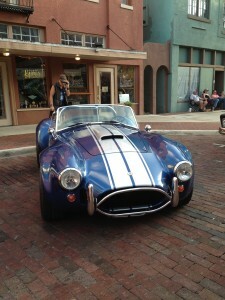 The car is a West Coast Cobra replica built by AC Exotic Cars in North Royalton, Ohio in 1991. The car is finished in LeMans Blue – an original 1967 cobra color – and silver stripes. The car spends its summers visiting car shows in Ohio and Pennsylvania. In the winter, the car spends its winters in Fort Myers, Florida. There have been 2 owners since the car was built in 1991 and has more horsepower and torque than we could imagine! What makes your car special? Send us a picture and story of your car to radrides@radair.com!